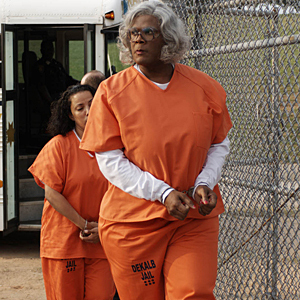 On Oscar weekend, Tyler Perry's “Madea Goes to Jail” produced gold for struggling Lions Gate Entertainment Corp. The new comedy shot to No. 1 at the box office, with estimated ticket sales of $41.1 million, according to film tracker Media by Numbers. The movie's big opening helped extend Hollywood's winning streak this year. Total box-office sales since Jan. 1 have reached $1.65 billion, up 23% from the same period last year, said Paul Dergarabedian, head of Media by Numbers. With the economy in dire straits, “The mood of the country is one of looking for escapism,” Dergarabedian said. Actor-director-producer Perry, who plays the feisty matriarch Madea, is building a strong franchise with the character. The box-office take for his new film was nearly double what his first Madea feature, “Diary of a Mad Black Woman,” brought in on its opening weekend four years ago. • Madea Goes to Jail is not only based on Perry's most popular character, it's based on Perry's most popular stage show, so Lionsgate was expecting something big. Just not $41.1 million big. “We were cautiously optimistic we could do 30-plus,” Steve Rothenberg, the studio's domestic distribution president, said today. • Madea Goes to Jail is not only Perry's top opener of all-time, besting Madea's Family Reunion ($30 million), it's Lionsgate's top opener of all-time, besting Saw III ($33 million). Even better for the studio accountants, Madea Goes to Jail, like Perry's other movies, was Hollywood-cheap, costing under $20 million. • Who saw Madea Goes to Jail? A younger, more diverse crowd than Perry typically draws. Per Rothenberg, 35 percent of ticketbuyers were under 25, up from 18 percent for his last movie, The Family That Preys; 13 percent were Hispanic, up from 5 percent. The core audience remained African-American women. • For Cosby Show completists, it should be noted Madea Goes to Jail goes down in the books as the highest-grossing Keshia Knight Pulliam movie ever.